New Chapter 11 Filing - Orion Healthcare Corp.
"...the Debtors are the victims of a large, complex, and brazen fraud that was subject to a complex and deliberate concealment effort perpetrated by their former management that was years in the making. After acquiring several of their businesses, the Debtors’ former CEO, Parmjit “Paul” Parmar (“Parmar,” who previously owned the company) took Constellation Healthcare Technologies, Inc., the parent company of the Debtors (and itself a Debtor), public on the London AIM and then proceeded to raise additional equity for additional acquisitions, many of which are believed to be largely or entirely fictitious. The Debtors borrowed approximately $130 million in debt in connection with a go-private transaction, the majority of which is believed to have been paid to Parmar (as a shareholder, through entities under his control), which is a financial burden the Debtors simply cannot sustain. The Debtors borrowed such funds based upon financials recently discovered by the Debtors’ new management and their professionals to be largely fictitious and involving numerous sham companies and fabricated transactions, revenues, and customers. The Debtors have commenced these chapter 11 cases to (i) market and sell their assets, (ii) wind down certain of their businesses, and (iii) to enable them to ultimately pursue claims against the individuals that put the Debtors in this position for the benefit of all their creditors." Orion Healthcare Corp. is in the business of (a) outsourced revenue cycle management (“RCM”) for physician practices, (b) physician practice management, (c) group purchasing services for physician practices, and (d) an independent practice association services, which is organized and directed by physicians in private practice to negotiate contracts with insurance companies on their behalf while such physicians remain independent and which also provides other services to such physician practices. The various businesses were cobbled together after a series of acquisitions. Constellation Healthcare LLC, a non-debtor, is an investment vehicle owned by Parmar and set up for the purpose of acquiring Orion back in 2013. Thereafter, the assets were transferred to a vehicle set up to be the holding company of the enterprise and subsequently listed on the London Stock Exchange's Alternative Investments Market. After that, the company went on an acquisition spree, picking up five new businesses. The company also hit the secondary market twice to finance the transactions. As if that isn't enough tomfoolery, the company then engaged in a take private transaction pursuant to which the sponsor contributed $82.5 million of cash as equity and the company obtained $130 million in financing from lenders. The company also issued unsecured promissory notes to its shareholders to the tune of $39.6 million. Parmar resigned from the company in September 2017 and, subsequently, the company has been engaged in a large forensic investigation that purports to have uncovered multiple fraudulent transactions while the company was publicly listed, including fabricated customer lists and associated revenue (which, naturally, would have the effect of jacking up valuation and violating reps and warranties, presumably, to the lenders). Moreover, it is alleged that there were a variety of sham acquisitions that had the effect of unjustly enriching Parmar to the detriment of the now-over-levered company. In light of all of this - as well as the unsustainable debt on the balance sheet and other issues such as the lack of integration between business lines and various litigation - the company filed for bankruptcy. The purpose of the filing is to market and sell some of the business, wind down certain of the businesses, and pursue claims against a coterie of allegedly fraudulent m*therf*ckers. New Chapter 11 Bankruptcy - Cenveo Inc.
2/2/18 Recap: Publicly-traded ($CVO) large envelope and label manufacturer with roots tracing back 100 years filed for bankruptcy. Interestingly, you, our treasured PETITION readers, probably interact with Cenveo's products in your day-to-day life. Cenveo prints comic books you can buy at the bookstore, produces specialized envelopes used by JPMorgan Chase Bank ($JPM) and American Express ($AMEX) to deliver credit card statements, and manufactures point of sale roll receipts used in cash registers and prescription labels found on medication at national pharmacies. Why did it file for bankruptcy? Disruption. And debt. The company notes that its filing was necessary to tame its burdensome funded debt and corresponding annual $99.4mm debt payments (inclusive of cash and "principle" payments). In light of its leverage, the company apparently also suffered from other pressures on the business, including restrictive trade terms and/or the departure of business from vendors. But, wait! There's more. And its textbook disruption. Per the company, "In addition to Cenveo’s leverage issues, macroeconomic factors, including the introduction of new e-commerce, digital substitution for products, and other technologies, are transforming the industry. Consumers increasingly use the internet and other electronic media to purchase goods and services, pay bills, and obtain electronic versions of printed materials. Moreover, advertisers increasingly use the internet and other electronic media for targeted campaigns directed at specific consumer segments rather than mail campaigns." Ouch. To put it simply, every single time you opt-in for an electronic bank statement, you're f*cking over Cenveo. More from the company, "As society has become increasingly dependent on digital technology products such as laptops, smartphones, and tablet computers, spending on advertising and magazine circulation has eroded, resulting in an overall decline in the demand for paper products, and in-turn lowering reliance on certain of Cenveo’s print marketing business. In addition, there is generally a decline in supply of paper products in the industry, such that only a handful of paper mills control the majority of the paper supply. As a result, paper mills and other vendors that sell paper products have a large amount of leverage over their customers, including Cenveo. The overall decline in the paper industry combined with the diminished supply in paper products has led to overall decline in the industry, dramatically impacting Cenveo’s revenues." Consequently, the company has spent years trying to streamline operations and cut costs: it is not entirely clear from the company's filing, but this disruption clearly led to the "downsizing [of] its workforce," a reduction in its geographic footprint, and asset dispositions. But, ultimately, earnings couldn't manage the balance sheet. The company engaged its various parties in interest and was able to secure a (shaky?) 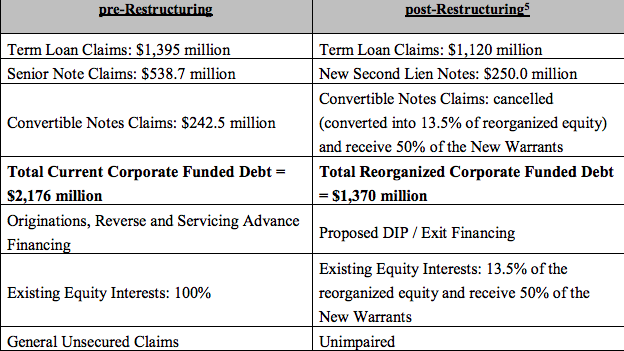 restructuring support agreement and a commitment of financing in the amount of a $190 million ABL DIP Facility provided by the Prepetition ABL Lenders and a new $100 million DIP Term Facility backstopped by more than a majority of the holders of First Lien Notes. It will need to address its underfunded pensions (approximately $92.9mm). New Chapter 11 Bankruptcy - Cumulus Media Inc.
11/29/17 Recap: It has become routine for a company to tout the synergistic benefits of an acquisition. But synergies only come from solid execution and integration of the new properties into the existing franchise. As we often see, that's a pipe dream that often fails to come to fruition. Take, Cumulus Media, for instance, which from 1998 through 2013, "completed approximately $5 billion worth of acquisitions to grow its network and station businesses," including two large recent acquisitions (Citadel Broadcasting in 2011 and Westwood One in 2013). Notably, "[t]he Company struggled to develop the management and technology infrastructure required to integrate the acquired assets and to support and manage its expanding portfolio. Additionally, certain of the acquisition projections proved erroneous and a number of subsequent management decisions failed to achieve their desired results. The Company was thus unable to achieve the cash flow projections it had made to support the prices paid for those acquisitions...." Projections didn't translate to reality? Color us shocked. Combine these operational challenges with "industry challenges" and you've got a recipe for decreased YOY trends in ratings, revenue and EBITDA. Since 2012. Yikes. But like most bankruptcies, this is a storm of multiple elements. Clearly, the above-noted transactions led to a tremendous amount of incurred debt, capex for integration, and interest expense on that debt. But, in addition, "advertiser and listener demand for radio overall has been negatively impacted by the availability of content and advertising opportunities in growing digital streaming and web-based digital formats, resulting in declines in radio industry revenue and listenership. As a result of these general industry pressures, high acquisition prices and subsequent poor performance, Cumulus Media found itself with an excessive level of debt relative to its earnings and rapidly approaching maturities on its funded debt." So, in other words, blame the debt, Facebook ($FB), Google ($GOOGL), Netflix ($NFLX), Amazon ($AMZN), podcasts, etc., for the decline in radio consumption. So, now the company is in bankruptcy with a restructuring support agreement in place to equitize the term loan. The term loan lenders will get take-back paper and 83.5% percent of the reorganized company. The noteholders will get 16.5% of the equity subject to management incentive plan. Shareholders will get bupkis. 7/28/17 Recap: Illinois-based not-for-profit corporation formed to finance the cost of acquiring, designing, constructing, and equipping a conference center, hotel (Westin), restaurant and related improvements in the Village of Lombard filed for bankruptcy with a prearranged deal with its creditors. The corporation was funded via revenue bonds (A through C, with the A-2 bonds wrapped by an ACA Financial Guaranty Corporation policy) on the basis of a 2005 market study. Much like we saw with the Chapter 9 filing of The Kennewick Public Hospital District back in June, the study proved to be off the mark and the project has underperformed from the get-go. Some of this was bad timing: the project came online in August 2007: we all know what came shortly thereafter. The convention business the Project depended upon never came, rendering revenues insufficient and debt service payments difficult. 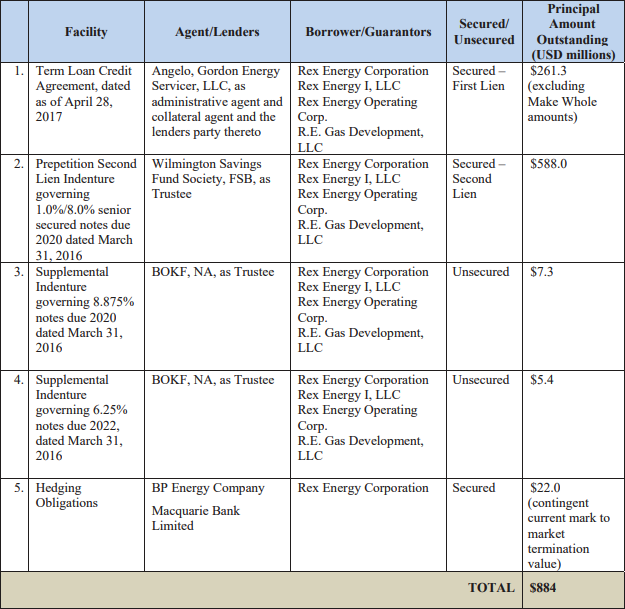 Reserves set aside for the bonds were quickly depleted and the Project defaulted on the bonds. The Project enters bankruptcy with the A bonds as the declared fulcrum and a consensual restructuring in hand with each of ACA, holders of a majority of the bonds (here, Nuveen Asset Management LLC and OppenheimerFunds Inc.), and the hotel and restaurant managers, respectively. Taking it as given that Lombard is an "affluent" suburb of Chicago, you have to wonder why people thought this financing was a good idea. Lombard sounds quaint and all - with its annual Lilac Festival and parade - but there's nothing there, far as we can tell, that screams "convention business." Query how many Mom and Pop municipal bond investors are getting burned by this (seemingly) ill-advised financing.